The size of wreath needed for your front entrance really depends on the look you want. For a bold and festive feel, go large! If you prefer a more reserved look, choose a smaller size. For a standard 36 inch wide front door, add dramatic impact with a wreath 28 inches to 30 inches in diameter. On the other hand, a wreath 20 inches to 24 inches in diameter creates a classic, understated look. For oversized doors, we recommend a 30 inch to 36 inch diameter wreath. This large size will carry the appropriate scale in relation to the front door. Typically, the larger the wreath, the higher you should hang it on the door. Since large wreaths usually weigh more than small wreaths, be sure to use a sturdy metal hanger or a securely fastened nail rather than plastic hanging fixtures. What to do with miniature wreaths? Use your imagination! Decorate door knobs, candleholders, bureau knobs, and other place you happen to notice needs a little sprucing up for the holidays. If you don’t wish to put a nail in your door, there are alternatives – try an over the door hanger or the 3M Adhesive Hangers all of which are available at your local home improvement store or local craft store. It is a great way to hang a wreath without damaging the door. Measuring an arched door for garland. 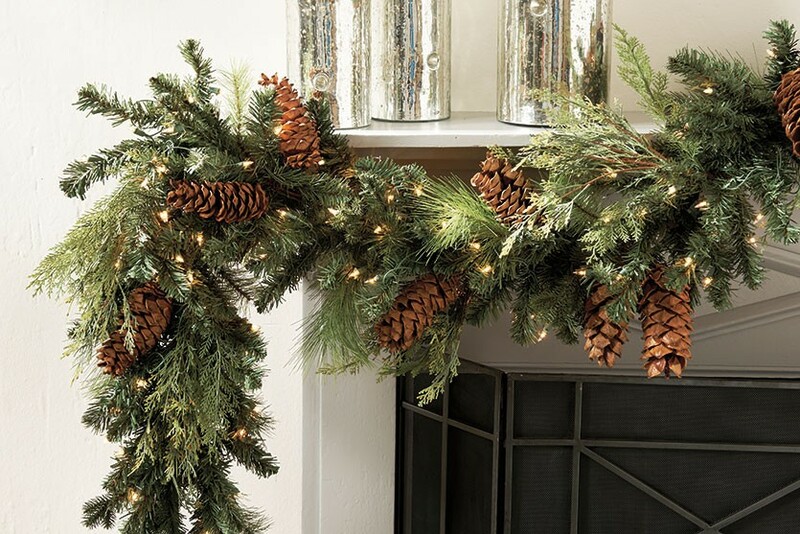 The trick is to make sure you have enough garland to accommodate the top arch. We have a simple solution for this. Add one foot to your total if you’d like the garland to puddle at the bottom. Measuring a standard door or double doors for garland. Simple math is all that’s required to be sure you have enough garland for your front entrance. This solutions works for double doors as well. Just be sure to measure the width across both doors, including trim. WIDTH – Measure from the outside trim of the door across to the other side. In our example, the door is 4 feet wide. Measuring a staircase banister or mantel to swag garland. To swag garland down a staircase banister or across the mantel, use the same strategy as above. Measure the LENGTH of the banister or the WIDTH of the mantel, then calculate one-and-a-half times that dimension. Example: 6-ft. W mantel x 1.5 = 9 feet of garland. Many of you want to know whether garland should drape over the sides of the mantel or not? Well, there are no hard-fast rules when it comes to hanging garland. It is up to you. Whatever you want to do – go for it! Hang garland the way you like it. Measuring a staircase banister or mantle to swag garland. Measuring a staircase banister to wrap garland. If all of this seems too complicated, use a ball of string, wrapping it as you would the garland. When you have the look you want, pull the string off and measure it with a tape measure. It can be that simple!